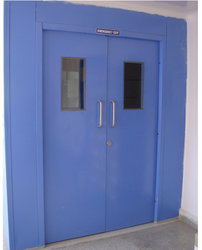 Prominent & Leading Manufacturer from Hyderabad, we offer clean room doors, economy doors, industrial doors, metal entry doors, metal doors and telecom shelter doors. We are the Leading Manufacturer and Supplier of Clean Room Doors, clean room stainless steel door, designed clean room doors, hollow metal doors. Clean Room Doors are Hallow Metal Doors filled in with Impregnated Kraft Paper Honey Comb (Imported from Netherlands) which is glued to the Inner Surface of the Door and Sealed for Acquiring Much Better Strength than a Normal Wooden Door. These Doors are available in Single, and Double Door Range. As the name indicates, these doors are Sophisticated, Aesthetic and Very Clean. These Doors are fitted with good quality SS hardware to increase the life of the door and to make it a trouble free unit. 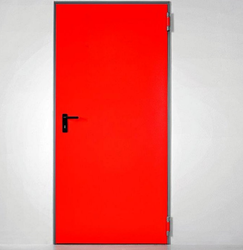 Presenting an Array of Ergonomically Designed Economy Doors that are manufactured using GI Sheets (Zinc Coated Sheets). These Doors are Hallow Metal Doors filled in with Impregnated Kraft Paper Honey Comb ( Imported from Netherlands) which is Glued to the Inner Surface of the Door and Sealed for Acquiring Much Better Strength than a Normal Wooden Door. These Doors are PU Powder Coated to improve the Elegance, Look and Life of the Door. These Doors are available in Single, Double, Triple and Four Door Range with variety of Colors to meet the choice of the customer. As the name indicates, these doors are very economical and are available at the cost of a normal wooden door. We are engaged in manufacturing and exporting of Industrial Steel Doors. 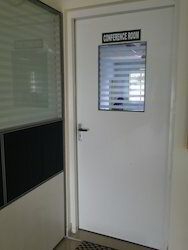 These Industrial Doors are manufactured using a Zinc Coated sheet making a Hallow box filled in with Impregnated Kraft Paper Honey Comb (Imported from Netherlands) which is glued to the Inner Surface of the Door, further the door is hot Sealed for Acquiring Much Better Strength than a Normal Wooden Door. Industrial Doors are Powder Coated to improve the Elegance, Look and Life of the Door. Industrial Doors are available in Single, Double, Triple and Four Door Range with a variety of Colors to meet the choice of the customer. 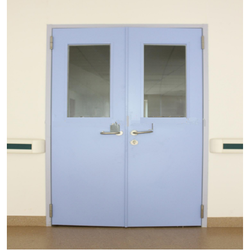 As the name indicates, these doors are very rugged and are used mainly where the number opening and closing of the door are very high, like in Commercial Complexes, Hospitals, Colleges etc. Further these Doors are fitted with good quality SS hardware to increase the life of the door and to make them a trouble free unit. Presenting an array of ergonomically designed Metal Entry Doors manufactured using GI Sheets (Zinc Coated Sheets) which are sturdy and resistant to Rust, Corrosion and Termites. These Doors are Hallow Metal Doors filled in with Impregnated Kraft Paper Honey Comb (Imported from Netherlands) which is glued to the Inner Surface of the Door and Sealed for Acquiring Much Better Strength than a Normal Wooden Door. These Doors are PU Powder Coated to improve the Elegance, Look and Life of the Door, These Doors are available in Single, Double, Triple and Four Door Range with variety of Colors to meet the choice of the customer. As the name indicates, these doors are very rugged and are used mainly where the number opening and closing of the door are very high, like in Commercial Complexes. These Doors are fitted with good quality SS hardware to increase the life of the door and to make it a trouble free unit. Presenting an Array of Ergonomically Designed Metal Doors Manufactured using GI Sheets (Zinc Coated Sheets) which are Sturdy and resistant to Rust, Corrosion and Termites. These Doors are Hallow Metal Doors filled in with Impregnated Kraft Paper Honey Comb (Imported from Netherlands) which is glued to the Inner Surface of the Door and Sealed for Acquiring Much Better Strength than a Normal Wooden Door. 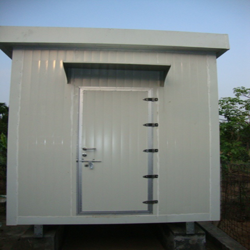 We Aacess Tough Doors Private Limited, Design, Manufacture, Install and Commission a wide Range of Telecom Shelter Doors. Our doors meet all the requirements stipulated by the Telecom Department. Looking for Metal Doors ?